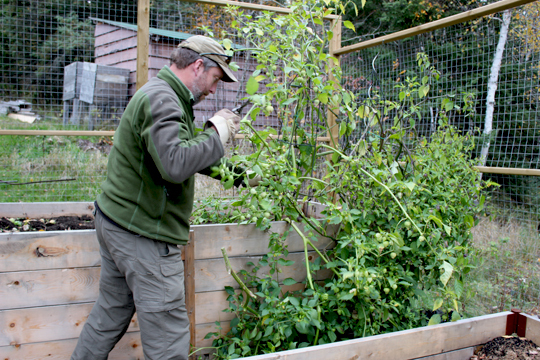 The harvest has begun, at least of some garden (and wild) edibles. 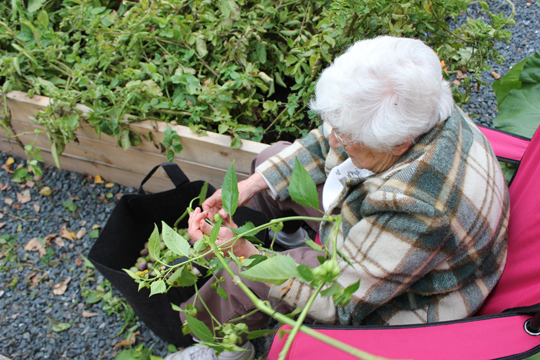 Elizabeth is hard at work bringing in produce, blanching or drying it or cooking with it and putting the results of her efforts into the freezer or on the pantry shelves for winter use. Some of the results are colourful, so we thought this week would be a good opportunity to show you. The gardens need some time to change before we go in and take more pictures. We’ve cut the Bee Balm blossoms twice now. 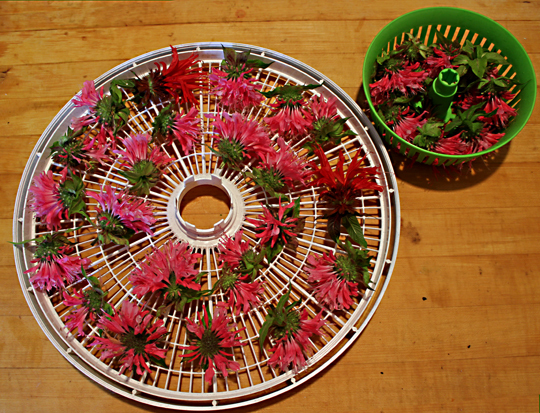 Here they are dunked in water (to eliminate insect life), spun dry and placed on the rack for the dehydrator. 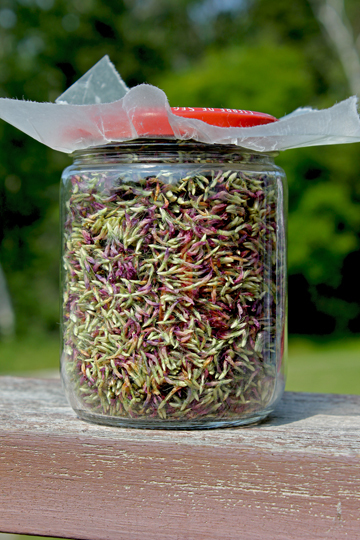 After a few days in the dehydrator, we bottle the whole flowers and store them in a dark pantry. 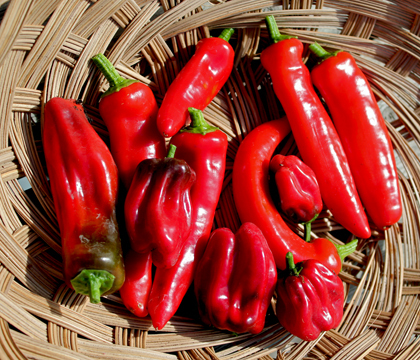 They make a good tea, especially when blended with the leaves of the same plant, which we will harvest a bit later. 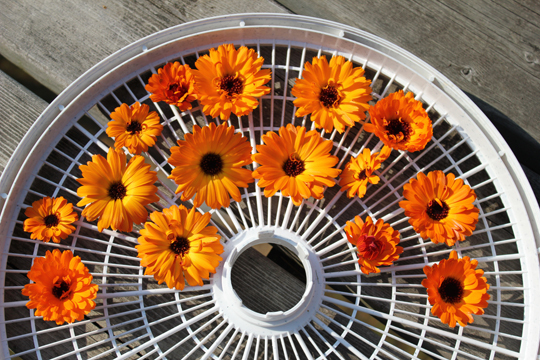 She hopes this year to get enough Calendula to make some ointment with it. 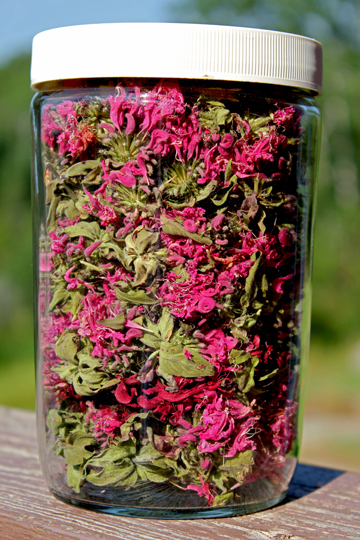 It is very healing, especially for insect bites, rashes and skin conditions like eczema. Calendula is also nice fresh in salads. 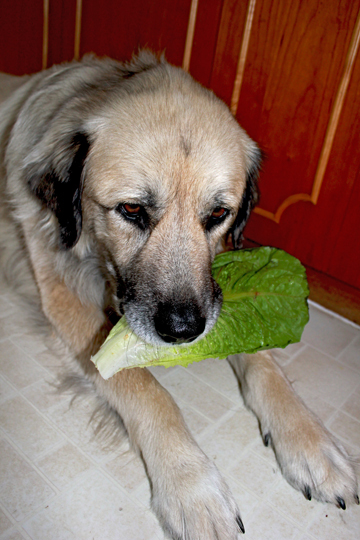 Looks pretty on the plate, too (the leaves when young are also great in a salad). She’s all finished with the clover now, which she also uses in tea. It adds a little sweetness to the mix. Some of the herbs she hasn’t got time to use fresh, or has too much to use up, she dries. 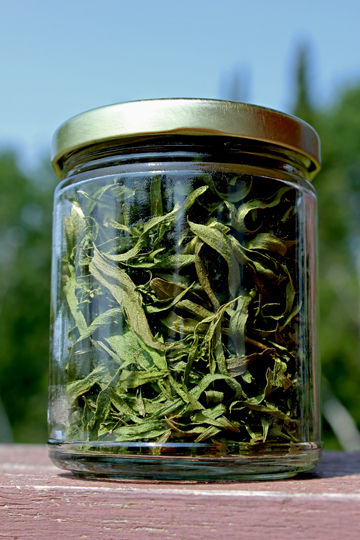 Here’s some of that French Tarragon she likes so much, all dry and ready to go on the pantry shelf. The Beets are coming in now, too. 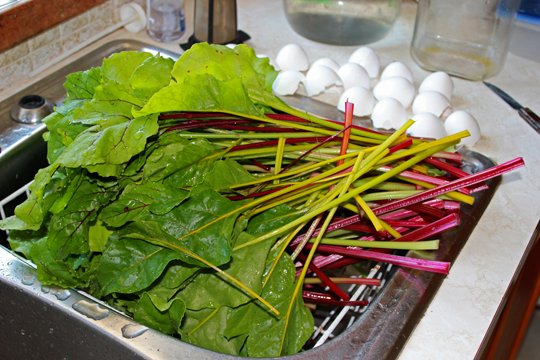 these are some freshly washed Beet leaves, which the two-leggers are preparing to blanch and freeze. …in a Tandoori fruit and yoghurt sauce before she pops them into the oven for a couple of hours. 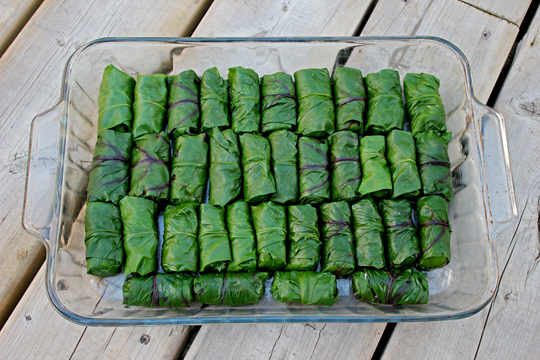 Elizabeth used one of the Hungarian Hot Peppers (the ones without the folds) in her Tandoori Beet Leaf Rolls. She hasn’t tried one of the Sweet Red Hot Peppers yet. Neither have I. She won’t let me try either! 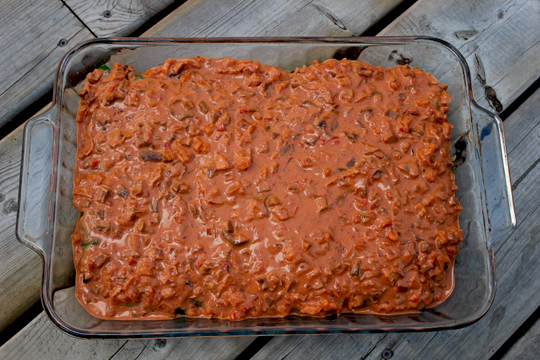 She used other ingredients from the garden, like a Hot Pepper, for example, and she even used something her sister-in-law and brother made from Crabapples growing in their garden in The Yukon: Apple Butter. Truly a dish of many colours and flavours! She’s really proud of herself. So, I had to let her go on about it. Sorry. 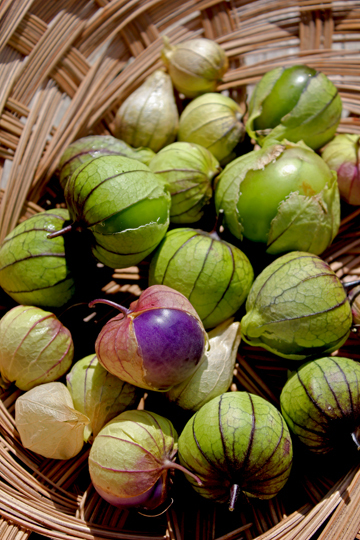 The first of the Purple Tomatillos are ripe, now too. Soon Elizabeth will make some Mango Chutney using them. While Kay and Elizabeth work in the kitchen, I like to supervise. Not only do they frequently need a taskmaster to fire them into action when they start focusing too much on chopping and forgetting things like pots of boiling water, but I also must ensure that nothing that inadvertently flies from the chopping block to the floor is trod upon or otherwise wasted. Elizabeth tells me that when she was a two-legger pup, she went to school. So did I, actually. But at her school, the teacher made students write essays on how they celebrated special days two-leggers have called ‘holidays’. Sunday was Thanksgiving Day, and two-leggers here get a holiday on the next day so they can travel back from home. They call it the ‘Thanksgiving Weekend’. I find it rather awkward to hold a writing tool, but I have my faithful scribe who, by her own admission, has had a lot of practice with this sort of thing. So, today I thought I’d tell you how I spent my Monday off, seeing as I didn’t have to travel anywhere. I have a nice view from my house if I keep my head up. That’s something to be thankful for. 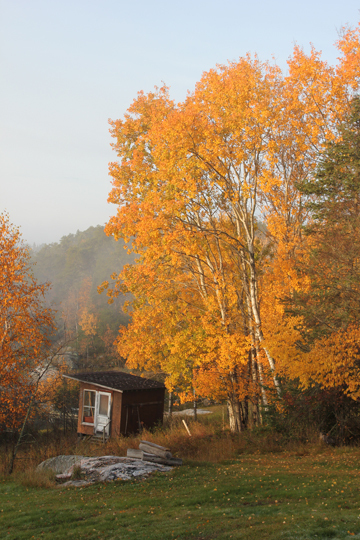 When we got back to the house, the mist was thinning quickly. After breakfast, it was work hard all day in the garden. Well, it was for the two-leggers. 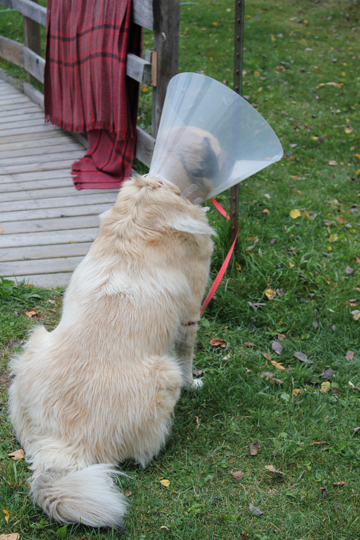 They took me on a couple of walks through the day, but I mostly lay in my cone and sighed, got up, rattled the cone on a door or some furniture, flopped onto the floor (that’s much noisier than it reads), sighed again and slept for most of the day. then he’d hand the branches to Kay and she’d start plucking the fruit. She got nearly 2.5 gallons from four plants! The Kibble Snatching Flappers came by, and even though Elizabeth gave them some kibble to keep them busy, I thought I maybe should watch the carrots a little more closely… just in case. 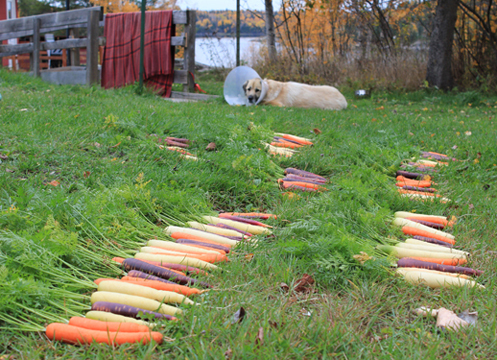 Me guarding the carrots while they dry. 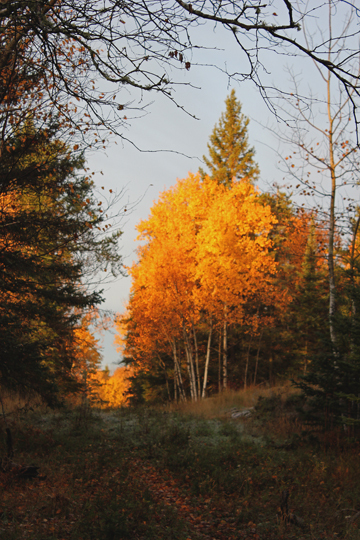 But I’d really rather be chasing deer…. Elizabeth thought she’d cheer me up. 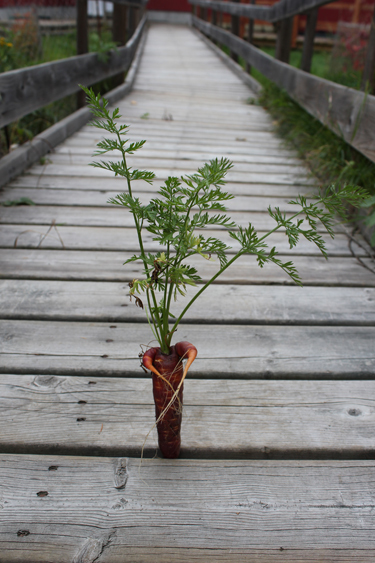 Elizabeth stuck this peculiar carrot in the walkway and said, “Here lies the road to Rome…” and looked at me for a tail wag. I don’t get it. Sorry. But what about that view! Even when it’s cloudy out, it’s just so beautiful here. And that’s something we are all very thankful for! 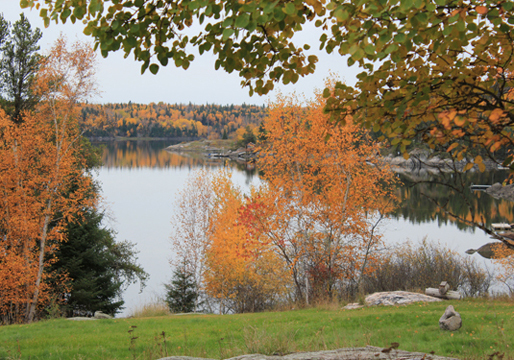 Thank you, Lord, for all the blessings we share: for beauty, for change, for safety, for friends, for food, for home. 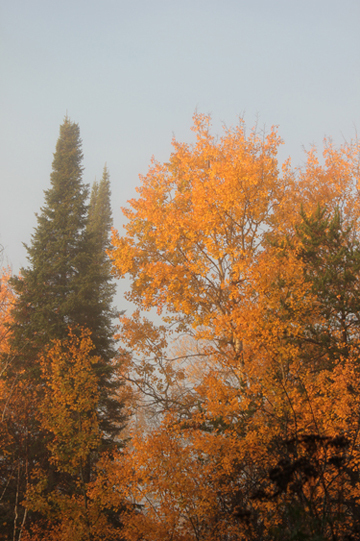 Please help us to share some of these blessings with all the two- and four-leggers we meet everyday. Amen.